As an Orlando resident, winter is my favorite season — and not just because the weather cools down enough to spend quality time outdoors. 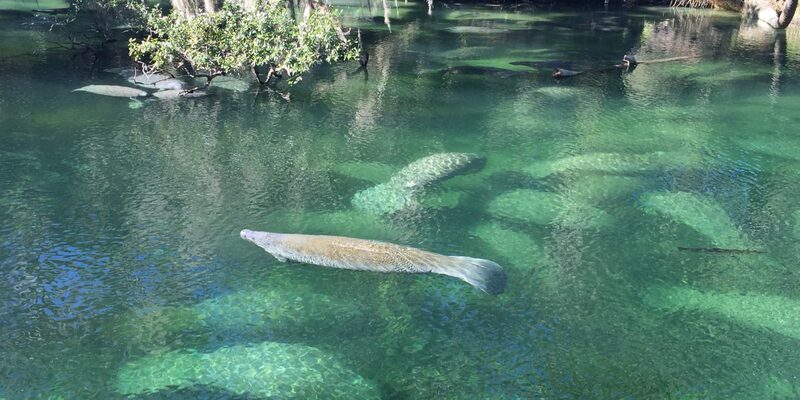 From November through March, it’s also prime manatee season: when the gentle, majestic sea cows flock to the balmy springs of Central Florida to nap, float and nap some more. If you’re lucky enough to be in Central Florida this winter, I suggest taking a break from the theme parks for an encounter with these lovable marine mammals. In fact, why not make a day of it and throw in some kayaking and German food for good measure? Meet the manatees at Blue Spring State Park. 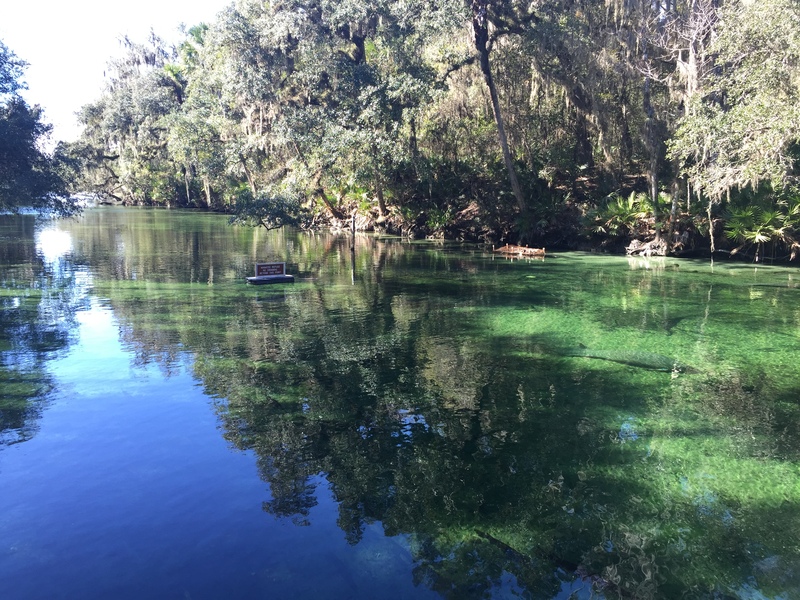 Head an hour north of the theme parks to beautiful Blue Spring — a favorite with manatees and nature lovers alike. During the winter, the warmth-seeking sea cows journey down the St. Johns River into the Blue Spring Run, which boasts a constant water temperature of 73 degrees. I once visited when nearly 400 of them were packed in the blue-green water (and yet they’re still so politely Zen that they gently squeeze around each other in a slow-motion water ballet). The main attraction of the park is the short trail and boardwalk that borders the spring. I like to slowly meander along this path, stopping at the various viewing stations to watch the leisurely manatees in (in)action. The trail also cuts through a tranquil stretch of forest where you just might spot an owl — or hear a noisy armadillo barreling its way through the underbrush. If your schedule is flexible, pick a cold day (that’s when the manatees arrive in droves). The park is open from 8 a.m. to sunset, and admission is $6/vehicle. You can bring your own lunch and use the grills and picnic tables, or grab some grub at the concessions stand. Kayak along the St. Johns River. During my most recent visit, I spent a while gawking at the manatees before rolling up my sleeves for a kayaking adventure. During my hour-long paddling excursion on the St. Johns River, I was struck by how relaxing it was: the waters were calm, the sun was shining, the water birds were singing and posing. 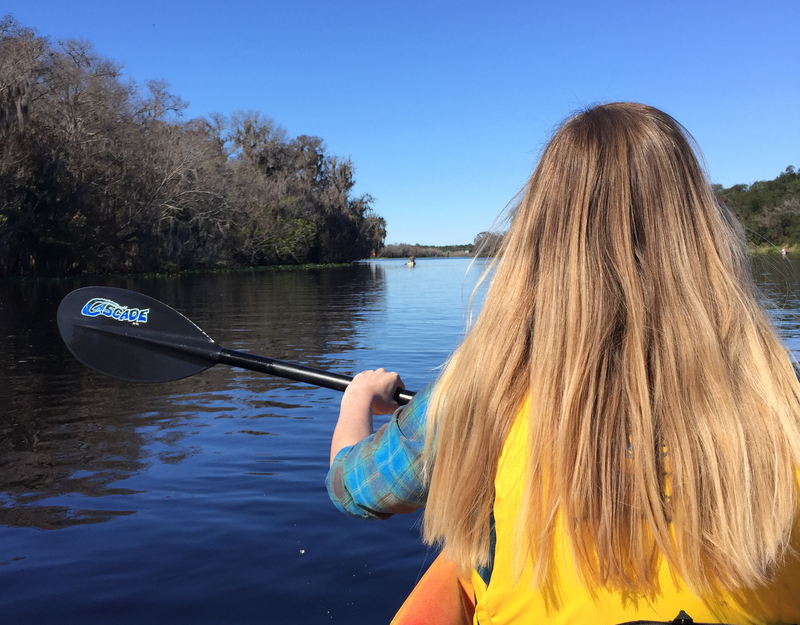 While the Blue Spring Run is closed to kayakers and swimmers in the winter to protect the manatees, you never know when you (or your kayak paddle) will bump into one on the river. If you’d rather sit back and let the wilderness come to you, you can opt for a 2-hour river cruise that departs from the state park several times daily. The boat moves slowly enough that you can soak in the sounds of nature while enjoying plenty of chances to see wildlife and learn about the history of the park, which was once a busy steamboat landing. You can rent a kayak, tandem kayak or canoe for an hour, half day or the entire day. When I visited, the rental company provided life jackets and a map, but not much safety or practical information, so if you’re new to kayaking, you may need to ask for extra assistance. Eat like a sea cow at Hollerbach’s Willow Tree Café. All that kayaking sure works up an appetite! 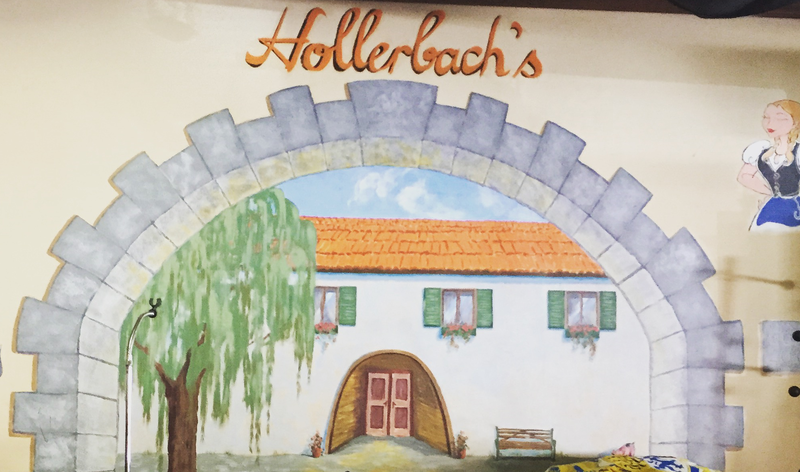 On your way back down to Orlando, stop in historic downtown Sanford and feast on an authentic German meal at Hollerbach’s. The last time I visited Blue Spring, I enjoyed dinner at this award-winning, family-owned restaurant and was not disappointed. My meal started with an appetizer of potato pancakes smothered in applesauce and sour cream, and ended with a dessert of German chocolate cake loaded with juicy cherries. And if you’re a carnivore, no German meal is complete without schnitzel – it’s available in pork, chicken or veal. Don’t forget to ask for extra gravy! Groups of four or more can partake in the popular Das Boot, a 2-liter glass boot full of beer to share. It’s a particularly popular option on weekend evenings, when live German music transforms the restaurant into a boisterous party. If you love the idea of chowing down to the sound of the accordion or the fiddle, make a reservation to ensure you snag a table. Downtown Sanford offers ample free parking, so you can take your time exploring the neighboring shops. For a nightcap, cross the street and unwind with a glass of wine at The Imperial, a boutique bar located inside an import furniture store. If you enjoyed this article, check out another great Orlando day trip.